Thanks, Christineann. I've substituted another clip. "Tom Jerry Beach Bully Bi..." This video is no longer available due to a copyright claim by Warner Bros. Entertainment. I located another clip; let's see how long that one remains available. This video is no longer available due to a copyright claim by Warner Bros. Entertainment Inc. 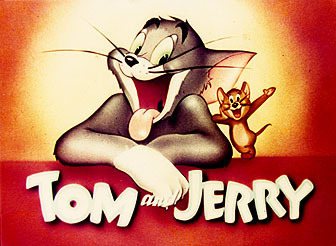 Early in the 1930's the Van Beuren Studios produced a series of b/w film cartoons also called "Tom and Jerry", featuring two bumbling fellows a-la Laurel and Hardy. Like the early Disney cartoons, these were also produced as small illustrated story books featuring artwork from the cartoons. A couple of these were read to me by my grandmother, and I really liked them, asking her to read them over and over to me.